18 & 19 October (Nation Multimedia) – The prospect of de-listing Ayutthaya from UNESCO’s World Heritage List seems to have sparked some editorials in the Thai Newspaper, The Nation. The second article also talks a little about the fall of Ayutthaya to the Burmese in 1767. Culture Minister Khunying Khaisri Sriaroon yesterday said it would be “unfortunate and embarrassing” if Unesco removes the Historic City of Ayutthaya and Associated Historic Towns from the World Heritage list following threat of encroachments from rapid development. Khaisri had received an initial report from the Fine Arts Department that the site, which was included in Unesco’s World Heritage List in December 1991, had problems with city planning that might lead to its exclusion from the list, the minister said. 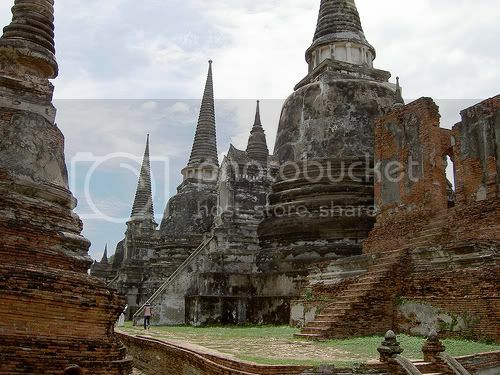 4 April 2007 (Thais News) – A 1961 law to protect ancient monuments in Thailand is amended to keep up with changing times. Particularly edifying is to see the act being amended to address the illicit transport (smuggling) of artefacts. The Cabinet meeting approves amendments to the 1961 Act on Ancient Monuments, Antiques, Objects of Art and National Museums and draft of the National Archive Act to conserve Thai heritage. Minister of Culture Khunying Khaisri Sri-arun (à¹„à¸‚à¸¨à¸£à¸µ à¸¨à¸£à¸µà¸­à¸£à¸¸à¸“) reveals that the amendments were made by the ministry to give a mandate to local administration officials to monitor ancient monuments. The minister says the amendments were written in line with the changing society and international standards on ancient monument conservation, especially those concern illegal transport of cultural objects. The amended Act also designates conserving areas for antiques and art objects located under water and on land.